One of the most important things you can do for your body is to keep hydrated. When you’re running and/or cycling, hydration becomes even more important. 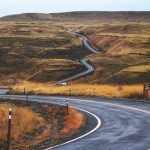 It’s important to consider what works best for you in your workout, however, there are so many choices out there to pick from. Inside are the top 11 water bottles for running and biking, so you don’t have to spend hours researching. 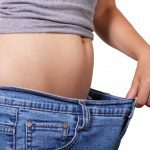 2.2 Why be Concerned about BPA? 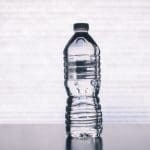 2.3 How is BPA Ingested? 2.4 How Can I Avoid BPA? When you exercise, you sweat. This sweat then evaporates off your skin to cool you. However, that does not solve the first issue sweating causes. When you sweat, you lose water from inside your body. That water performs a variety of functions within the body. You want the most out of your workout, whether that’s sustaining performance or improving it. The loss of water through sweat decreases the blood volume within the body. Blood volume may sound magnanimous, however, that blood volume affects performance. With less blood volume, there are fewer vessels for oxygen floating around your body. Fewer vessels mean less oxygen reaching your muscles. With less oxygen, your muscles cannot sustain the chemical reactions necessary for peak performance. As complicated as that sounds, it does not have to be. Your body will let you know when it’s thirsty. Following the prompts your body gives will keep you at your best throughout your workout. The biggest issue with water while working out is the risk of dehydration. The Mayo Clinic defines dehydration as losing more fluids than you take in to the point of having inadequate fluids to carry out the body’s functions. 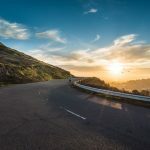 For a runner or cyclist, this usually happens through excessive sweating over an extended period, if it happens at all. The symptoms of dehydration are unique to each individual person. Common symptoms though include fatigue, dizziness, and confusion. When dehydrated, urination will become less frequent. When urination does occur, it will be darker. Most people also experience an extreme thirst when they dehydrate. If you are unable to keep fluids down, it’s time to go to a medical professional. 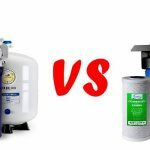 Proper hydration does not always mean the complete replacement of fluids. The older method required athletes to stand on a scale before and after a long workout. They then had to drink enough fluids to make up the weight. This is unnecessary if you follow your body’s prompts before, during, and after the workout. Carrying a water bottle makes hydration easier since you can sip when you’re thirsty. BPA is short for Bisphenol A. BPA is commonly found in polycarbonate plastics. Drinking bottles, compact disks, and medical equipment may have these plastics. Some epoxy resins used to seal metal containers such as food tins may also have BPA. Why be Concerned about BPA? The long-term effects of BPA exposure have not been studied. BPA has only been around since the 1960s. However, in a CDC study, 93% of 2517 samples contained signs of BPA exposure in 2003. That level of exposure is considered pervasive. There is growing concern about children and BPA. Dr. Bauer explains that BPA exposure may alter brain and behavior, particularly in young people. The FDA has said very low BPA exposure is normal and safe. However, reduction in exposure is recommended should you feel concerned. Making items that have BPA is not inherently bad. However, there is growing concern about its ingestion. BPA is common in food and liquid storage. Over time, BPA may leach into the items contained inside it. Leaching happened quicker when the container is exposed to heat over time, such as repeated microwaving. It may also occur in reaction to certain nutrients. How Can I Avoid BPA? BPA free items are becoming more common. Many food container brands chose to remove BPA, as have water bottle companies. However, it’s still important to research products to ensure their compliance and decide what measure you’re comfortable with. You may wish to start by buying a water bottle free of BPA, or you may choose to boycott canned goods entirely. Regardless of your choice, remember to keep abreast with current research on BPA in your exercise equipment. You spend too much time in it to do less. Polar water bottles are specifically designed to be a biking water bottle. Each water bottle fits in a standard bike cage, so the bottle needs no special equipment to mount. The bottles come with a double wall for insulation and it does keep liquids cool for long rides. With one of the more affordable price points, it’s a strong contender for the top bottle. The Original Insulated Water Bottle - As the first to make insulated, BPA-free plastic sports water bottles, Polar Bottle has had over 20 years to perfect keeping liquids stored and cool for twice as long. Ultimate Thermal Protection - The double-wall construction of our insulated water bottles creates a thermal barrier of air to keep heat out and cold in. Foil layers reflect solar rays for additional thermal protection. Dishwasher and freezer safe. 100% BPA-Free Water Bottles - Polar Bottle water bottles are and always have been 100% BPA-free and phthalate-free. Constructed of durable, lightweight and FDA food grade approved LDPE. Removable carrying strap offers extra convenience. 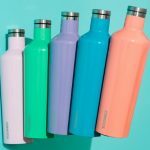 Polar makes their bottles in a variety of sizes and colors, so you can pick what you need. 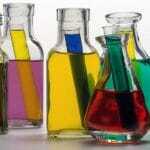 Many people find the bottles to be durable and easy to use. However, lids have been known to leak, and it does sweat. The Podium comes in a variety of styles, including insulated. They also come in several sizes, depending on how much water you need. 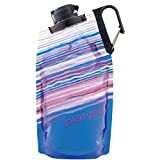 Camelbak also offers a unique lid choice, making it easier to drink on the move. It also has a wide mouth, for easier ice cube insertion and cleaning. Camelbak guarantees all their equipment. The Podium offers a slightly flexible shape, making it easier to fit into hydration belts and bike cages alike. However, some people find it does not freeze well and that it later leaked. This running water bottle may not look like much, but it’s packed full of features. When the bottle is empty, it rolls up for easy storage and transport. When it’s full, the bottle holds its shape and is leakproof. While the bottle may not have conventional insulation, it is freezable and heat resistant. Some people do not like the feel of the bottle in their hands. There are also accounts of a weird aftertaste in the water. However, the bottle is very convenient and designed to be durable. This bottle offers a unique exterior design with a functional grip. While the bottle lacks insulation, and it does sweat, the built-in grip makes it easier to handle. The bottle is also translucent enough to see how much you’ve drunk already and allows you to plan for refills. There are some complaints that the bottle has too much give in it for comfortable use. Others state the odd shape is difficult to put in a hydration belt. 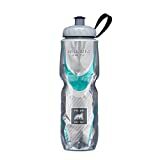 However, the leak-proof design and easy cleaning offer a well-rounded running water bottle. While this one would be difficult for cyclists, it’s perfect for runners. The Sprint is a handheld water bottle. It features a small reservoir, adjustable strap, and a small pouch. The adjustable strap secures the bottle to your palm while you’re running. It is ergonomic, and many people forget they’re wearing them until it’s time to drink. There is no insulation in this bottle, and it’s designed to be exceedingly light. People usually find the attached pouch is not enough to carry a phone but holds cards and keys well. It’s a great little bottle for short to mid-distance runs. This hydration belt holds two small water bottles. The bottle must ride on the hips to be bounce free. It’s perfect for longer runs and holds everything securely. There’s a pouch as well, though not all phones fit. This product also features unique add-ons like racing bib toggles. 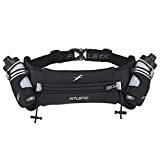 BOUNCE FREE: Fitletic Hydra 16 water bottle belts have patented Dura-Comfort Technology which guarantees NO bouncing, riding up, or chafing when running. PHONE FRIENDLY: Fits up to iPhone 8 Plus and Samsung Galaxy S8+ (with thin case), so easily play music, check maps, or make calls while on the go. MULTI-FEATURE: Hydration belt + insulated pouch + energy gel loops + race bib toggles. 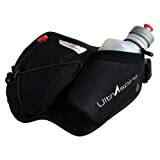 Use as a running belt, race belt, triathlon belt, trail running belt, marathon belt, or ironman belt. While there are few complaints on the quality of the belt, there are reports about the water bottles leaking. Some people have found the placement difficult, and so the belt rode up. However, this hydration belt is solid for longer excursions. Rather than cluttering up your hips or making you lean into awkward positions on the move, this pack wears like a backpack. With a significantly bigger reservoir than most bottles, it works well for extended expeditions. The harness and back are a lightweight mesh, making it a comfortable wear. It also sports Camelbak’s unique drinking design of bite to drink. There’s even a pocket for snacks and ID. Individuals report that these are difficult to close in such a way as to seal. It’s also different to fill since the mouth is on the side rather than the top. However, the expanded water capacity is great for the perpetually thirsty. 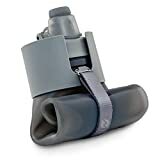 The Duolock offers another possibility for runners on the go who don’t want to be stuck with an empty water bottle. The bottle collapses flat when it’s empty, allowing it to be rolled up. It has a wide opening, allowing for ice cubes to be inserted easily. It also features a clip rather than a band for hanging. Unfortunately, all that flexibility does come at a price. Some people find them not as durable as imagined and wrote reviews about leaks. Other found them difficult to drink from. They offer a great, multipurpose water bottle option. This belt is meant to be worn front facing. The running water bottle design includes a pouch and a water bottle holder. This model is designed to hold a single half liter bottle without sloshing around. The materials making up the belt are sweat resistant, so you don’t feel soaked after a long run. Like many water bottles, this one has limitations in the bottle design. However, overall, it’s a solid choice. While this may not fit well in a bottle cage, it is perfect for sliding into a hydration belt. The Soft Flask is designed to compress as you drink from it, reducing the area of the liquid to slosh around in. It’s also designed to dispense energy gels, rather than just water. This unique feature means it’s a multipurpose possibility. HYDRATION VEST COMPATIBLE - fits easily in most hydration vest, belt or pack pockets. PACKABLE - Soft material conforms to any pocket. COMPRESSIBLE - Shrinks as you drink reducing water movement. Some people find it difficult to get their gel out once they get in. Others found the nozzle difficult, needing two hands at times. However, most agree that one bigger flask of gel beats the multiple packets option. On many cycles, there are a cage or two mucking up the main triangle. This bottle is different since it needs no cage to remain attached to the bike. Instead, it has its own, discreet mount. The bottle secures to those with a click. This unique way is highly innovative, even though the bottle design is standard. Some people found that their bottles did not secure fully. Other found it difficult to attach without looking down while riding. Overall, it’s an excellent up and coming design for a biking water bottle. You spend a lot of time running, cycling, and otherwise working out. The water bottle you choose to use matters a lot when you spend that much time with it. It will go with you on long and short workouts, staving off dehydration the whole way. A lower quality product simply will not do. 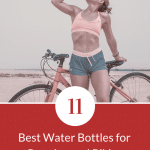 Whether you choose one of the top 11 water bottles for running and cycling listed here or not, it’s important to choose a quality BPA free bottle for your workout. Take a little time to research and order the one that’s best for you and what you need. Great list, Kelly! Thanks so much for including the Nomader Collapsible Water Bottle. Happily! Its an awesome product for runners. I love how it rolls up.